When it comes to a vegan staple, hummus is right up there at the top of the list–it’s healthy, can be made low fat or fat-free, travels well, and can be spread in a sandwich, a pita, or used as a dip. The usual treatments with garlic and lemon, or the addition of roasted red peppers, dill or cumin are all delicious standard hummus flavoring. Nevertheless, sometimes these old chestnuts or, er, chickpeas, can become, well, a bit ho-hummus. 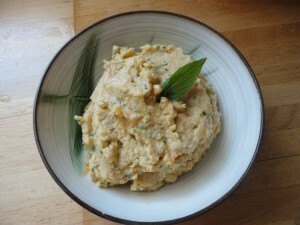 If you are ready to dress your hummus up Asian style, read on. I dreamed this up to eat on the go when Mike and Kelly were here to help me move. 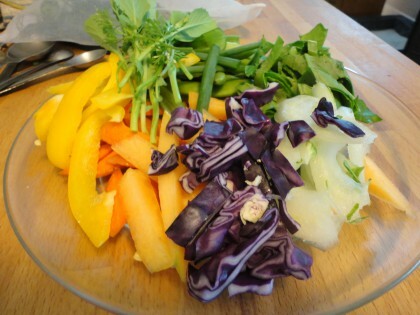 It went great with a large bag of sugar snap and snow peas Kelly had grown in their garden. The idea for it was first born when I remembered they like a chickpea burger recipe I found and adapted a couple years ago on the McDougall food and recipes forum which pairs spinach and chickpeas with a little peanut butter. It may seem like an unlikely combination, but chickpeas and peanut butter are naturals together. And they like going with spicy, sweet and green, too. 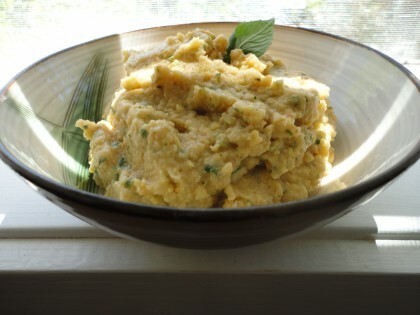 And unlike the burgers, this hummus recipe with a far eastern flair doesn’t have to be cooked. It takes just a few minutes in the food processor, and gives the truism that hummus travels well a whole new meaning. Put the garlic and mint in the food processor first and process, then add everything else and process until you get a nice hummus consistency. If it’s a bit dry, add just a tiny bit of water at a time, but you might not need it at all, so use a very light hand. The tamarind paste is optional, but it adds a really nice sweet-tart dimension. You can use any veggies (and even fruit) you like. Just use up what you have, and go for colorful. This particular day at my house it happened to be yellow bell pepper, cilantro, arugula, cantaloupe, carrots, red cabbage, green onion tails, and bok choi stems and greens. Unfortunately, I don’t have video making capacity or background music like Susan’s professional demonstration does, but that’s nothing a silly sense of humor and a little low tech imagination can’t address. How about we each simply humm-us some classical music while moistening the round rice “paper” (the kind you buy to make Spring rolls, easy to find in the Asian section of most grocery stores) in a pie dish of warm water. If you’re feeling contemplative and deliberate, perhaps the repetitious build of Pachelbel’s Cannon would suit. If you’re feeling more peppy than that, or making them for a get together, perhaps Mozart’s Eine kleine nachtmusik would literally underscore the feeling of celebration. I guess if you’re nervous about whether or not they will come out of the water in one piece you could dramatize the moment by humming the beginning of Beethoven’s Fifth Symphony.) With or without classical music as accompaniment, I particularly enjoy the process of feeling the thin stiff wafer-like “skins” become wet and pliable as I slowly twirl them in the warm water with my fingers. The gentle splish of the water is often all the soundtrack I need. Immersed in those movements, a spontaneous zen meditation, I’ve become completely at home in my new kitchen. If you’re not the Spring roll type, a scoop of this hummus adds flavorful and substantial creaminess to a brown rice and veggie stir fry. Whatever your pleasure, I hope you’ll enjoy this yummy hummus that’s gone farther “East” than most hummus has boldly gone before. Tamarind paste and all. A great spin on a classic! I love Thai flavors, and I agree that chickpeas and peanut butter are a smart match. 🙂 I will have to try this next time I’m making some hummus! 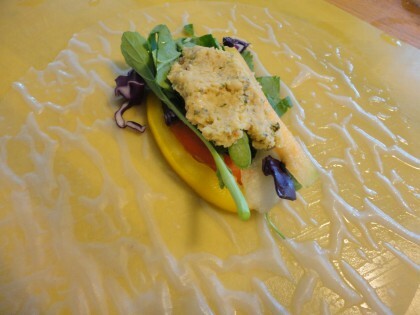 And I like how you put it in a spring roll wrap, too! Yum. This hummus recipe sounds absolutely delightful. 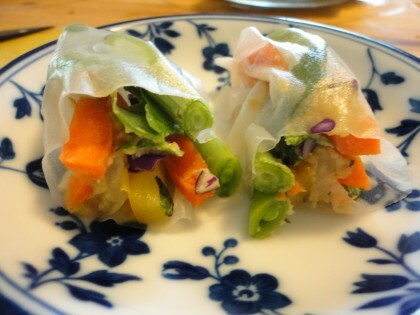 We adore Asian flavors and spring rolls are a favorite at our dinner table. 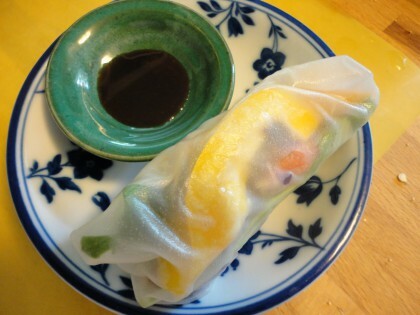 Your Thai hummus spring rolls will definitely be served up for dinner one night this week! Looks yummy Maria…..thank you! I will definitely try it! You’re welcome, Debra–hope you like it! what is the brand of the teriyaki sauce that you use? HI Marge–It’s San-J Teriyaki Sauce and Marinade. Pretty good stuff. Not soy free, but small amounts of soy are fine for me. I have no known allergy to it, but if you are allergic to soy this one will probably not be for you. We made this as a sandwich spread for dinner tonight and it was fantastic. A keeper! So glad you enjoyed it, Corrin–thanks for letting me know!